We’re pleased to launch a new series of fact sheets developed with our partners in the Coalition for the Human Rights of Indigenous Peoples! The three fact sheets are brief but full of important and timely information. Ideal for printing and handing to elected officials or passing out at events or rallies, each fact sheet covers a practical area where confusion and misinformation abound. We hope these new sheets will help in the on-going work of raising awareness and understanding. Free, prior and informed consent. Each fact sheet is suitable for a general audience and answers key questions. 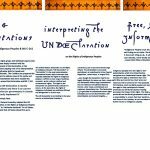 Myths and Misrepresentations: The UN Declaration on the Rights of Indigenous Peoples & Bill C-262 explores key myths circulating, such as: that the UN Declaration creates special rights for Indigenous Peoples that other people don’t have; the UN Declaration undermines the balancing of rights in Canada’s constitutional tradition; and Bill C-262 would create chaos in Canada. 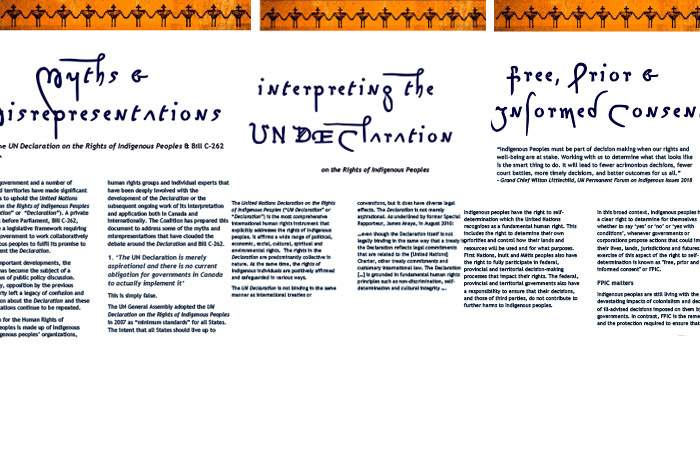 There’s a great deal of confusion as to how to interpret and use the UN Declaration, so to the rescue comes the fact sheet Interpreting the UN Declaration on the Rights of Indigenous Peoples. For instance, did you know that the Declaration needs to be read as a whole, and that reading individual articles in isolation leads to misinterpretations? We see mistakes like this all the time in the media, and even in writing by legal scholars, so it’s time to understand better how to interpret the Declaration. Learn more about CFSC’s work in support of Indigenous Peoples’ human rights.